Diamond Aircraft Industries, DA-20-C1 – a pretty trainer, indeed! | Shortfinals - aviation and more! By the early 1980s, the General Aviation industry in the United States – particularly that segment involving training aircraft – was under threat. Product liability lawsuits (in some cases), and a product range that had, basically, ossified over the past 30 years had left it vulnerable. If the foreign opposition could establish itself in the marketplace, that is. The Cessna 150 had first flown on the 12th September, 1957 and by 1985 the 150 (23,949), its close relative the Cessna 152 (7,584), and their French-produced cousins, the Reims-Cessna F152/FA152 (641) were getting very long-in-the tooth in design terms. 31,533 aircraft is a huge production run, surpassing many WW2 fighters, e.g. 20,334 Spitfires, for example, but the nicest thing you could say about the 150/152 is that it is ‘reliable’. Unfortunately, the Piper PA-38 Tomahawk, built from 1978-1982 for a total of 2,484 aircraft and which was intended to dominate the market, was quickly found to be unpopular with instructors and pupils alike due to difficult stall/spin characteristics. Not for nothing did it become known as the ‘Traumahawk’! In 1981, a new aircraft manufacturer was founded in Friesach, Austria. Named Hoffmann Flugzeugbau, it was involved in the production of motor gliders. By 1991, the company had been renamed HOAC AG, and had started work on the Super Dimona, a Rotax 912-powered HK36R motor glider. This was developed into the company’s first General Aviation aircraft, the DA20-A1 Katana, powered by a Rotax 912F3, a variant of the engine with water-cooled cylinder heads. The aircraft was an all-composite, side-by-side two-seater, of modern, ‘pod and boom’ design complete with a T-tail. The wing had an aspect ratio of 10, with significant upward twist at the wingtips. The DA20 was also to be built by a new company facility in London, Ontario, to service the U.S. market. There was a certain amount of sales resistance amongst owners of U.S. flight schools and instructors at first, as the idea of an all-composite trainer wasn’t well received; not only that, but the water-cooled Rotax produced only 81hp, and the DA20-A1 hardly gave a sparkling performance, particularly in ‘hot and high’ situations. Initial climb rates as low as 300 feet per minute were recorded. Still, the aircraft did have an all glass-cockpit! It was advertised as having low operating costs over the life the aircraft, and as being ‘the leader in the mass training field’, and there was still the need for a replacement for the venerable Cessna 150/152. Canadian-produced DA20-A1 aircraft were reaching the flying schools by 1995. Visibility for both student and instructor was excellent, and the cruise speed of 137 mph and range of 600 miles proved adequate for its designed mission. A special version of the aircraft, the DA20-C1 “Falcon”, was operated on behalf of the United States Air Force Academy’s AFS (Academy Flight Screening) programme by Embry-Riddle Aeronautical University, with throttle and stick controls and instrumentation altered to suit continuing flight training in other USAF aircraft. Unfortunately, since 2007, the DA20-C1 ‘Falcon’ is no longer part of the AFS, although a private company in Colorado – Doss Aviation – does perform Initial Flight Screening for the USAF using DA-20 aircraft. You can still buy a DA20-C1, but the company is now focusing on their DA-40 and DA-50 Series, both of which have an IFR rating; the DA-20 could not achieve the required degree of lightning protection, so was restricted to Visual Meteorological Conditions, only. This was a major detriment when it came to sales of new aircraft. The handsome aircraft you can see here is parked on Duxford Airfield, during an Imperial War Museum event. 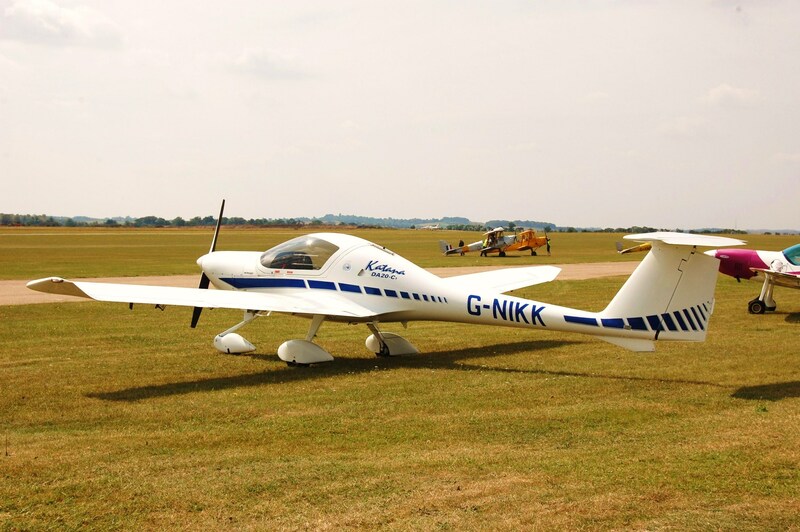 G-NIKK is registered to Cubair Flight Training Ltd, of Redhill Aerodrome, Surrey,(IATA: KRH, ICAO: EGKR), just south of London. To quote the company, “Cubair is a small friendly flying school specialising in flying training for the Private Pilot Licence, associated ratings and tail wheel training.” However, G-NIKK it is not one of the Austrian-produced aircraft, as you would expect, but was built in Canada in 2000 as a DA20-C1 ‘Katana’, and was formerly on the U.S. Register as N909CT. The Diamond Aircraft DA-20 Katana. Despite the odd false step or two, the launch of the DA-20 could very well have marked the start of a new wave of training aircraft designs! I teach on G-NIKK, as well as the Rotax-powered Katanas at Cubair, and they are very good trainers. I am also a fan of the Tomahawk, which, like the Katana, produces a more accurate pilot than some of the heavier alternatives. Both are also much more fun to fly for the experienced pilot! A good friend of mine, in Tennessee, has a daughter who learned to fly on a Katana; they really are a fun aircraft. I’m glad to see that Cubair is doing so well!